I’m not scared of fixer-uppers. I’ve lived in houses that were described as “needing work.” I’ve bought houses — more than once — that were kindly referred to as being in “as-is condition,” complete with extension cords as part of the electrical system and crawl spaces that were deemed inaccessible mystery areas. 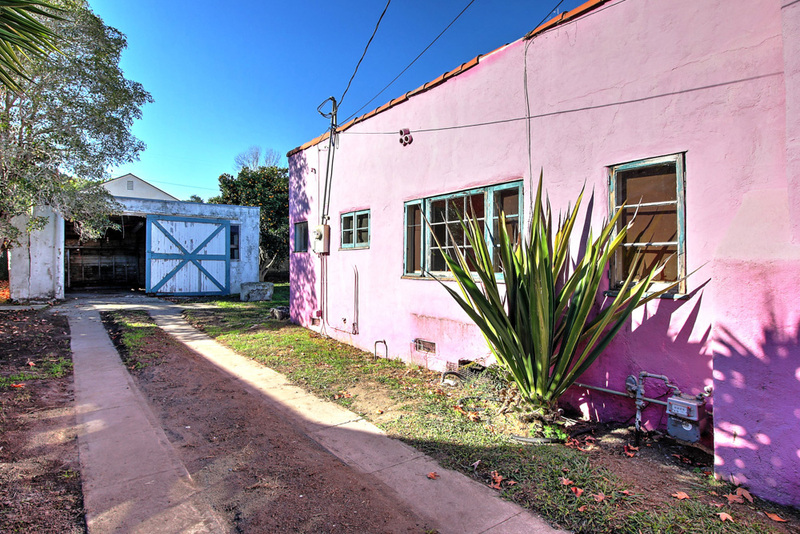 I’m no stranger to the compromises that many of us make in order to be able to afford a home in Santa Barbara. But no matter the condition, you know when a house is meant to be yours. And once you’re in love, reason can fly out the window, even when making the biggest financial decision of your life. When I asked to visit the house for sale at 1621 Clearview Road, I was warned that the house is a fixer-upper, and that if it was raining, I’d see buckets in the living room. I was not to be deterred. I made sure I was wearing sensible shoes and a jacket with a hood, just in case the raindrops missed the buckets. I adjusted my expectations and headed over to the Westside. A turquoise front door with a curved peekaboo window and vintage hardware is set into the left side of the porch and opens into the living room. 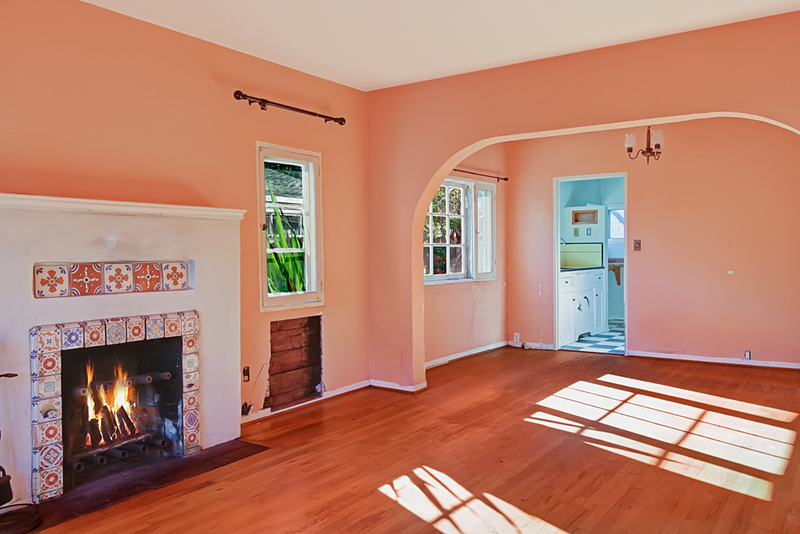 Hardwood floors, original wood-framed windows, and peach-colored walls grace the living room and an adjacent dining alcove. A striking fireplace set off by a white mantel and framed with orange and blue tiles is the focal point of the living room and looks like the perfect place to snuggle on chilly nights. An arched opening leads into the dining area and the kitchen beyond. The house was built in 1925, and the kitchen shows off what appears to be the original tile counter and backsplash. A back door from the kitchen opens to a big, private backyard, where a lawn with fruit trees leads to a one-car detached garage with a separate laundry room. Back inside, a hallway leads to one bedroom in the front and another in back, with the bathroom in between. The bathroom is evidence of why this house is a fixer-upper. It has a bathtub and a toilet, but no sink. And no drywall. It’s a project waiting to be tackled. True to the warning I’d been offered earlier, buckets stood ready, and the ceiling looks like it needs some attention. But the back bedroom has French doors that open out onto the backyard. I can imagine a patio outside that door one day, maybe sporting a fire pit or even a hot tub just steps outside the bedroom. However, those are prospects for the future. This house has plenty of needs to be tended to beforehand. I hope that someone falls in love with this little cottage: with the tiles in the fireplace, the succulents in the front yard, and the peekaboo window in the front door. I also hope that they have patience, a good imagination, and maybe even a contractor’s license. Because this house needs — and deserves — some TLC to bring it back to its original splendor and to set the stage for a magical future. 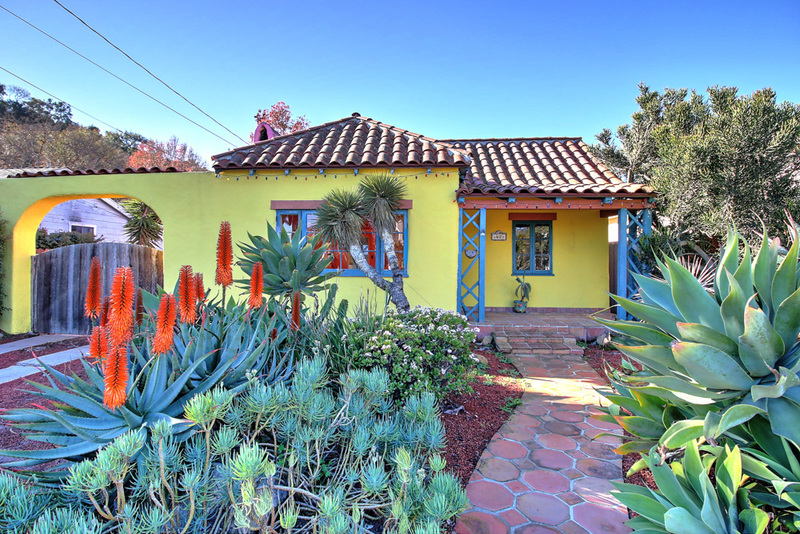 1621 Clearview Road is for sale in Santa Barbara, offered by Kirk G. Hodson and Jon-Ryan Schlobohm of Compass. Reach Kirk at (805) 886-6527 or kirk@kirkhodson.com and Jon-Ryan at (805) 450-3307 or jr@jon-ryan.com.